I cannot quite contain my excitement. A few minutes ago I managed to catch theonering.net post on facebook about the newly released “The Hobbit: An Unexpected Journey Annual 2013”. I immediately hurried to the online website I buy books from and placed my order for it. Why? Well, because this is the OFFICIAL Hobbit Annual, published in advance of the amazing new movie by Peter Jackson, packed with stills, characters and information from the movie sensation. Join Bilbo Baggins on his unexpected journey across the wilds of Middle-earth with Gandalf the Wizard and a company of thirteen Dwarves! This Annual is the ideal gift for all Hobbit and movie fans. Full of character profiles, Hobbit activities and information, this is the perfect companion to the blockbuster movie. Here are some of the images from the Annual. Balin was the senior member of the Company of Dwarves selected by Thorin Oakenshield for the quest to reclaim the Lonely Mountain from Smaug the Dragon. Balin was courageous as well as kind-hearted and he became fond of the Hobbit Bilbo Baggins. After the quest, Balin led an expedition to the ancient Dwarf realm of Khazad-dum but that quest ended in tragedy. Balin, son of Fundin, was born in 2763 of the Third Age. He had a younger brother Dwalin. Their familiy was of the line of Durin. Balin lived at the Lonely Mountain as a child. When Smaug the Dragon descended on the mountain in 2770, Balin was outside with Thorin Oakenshield and escaped with him. Balin’s father was killed in the Battle of Azanulbizar in 2799, and afterwards Balin accompanied Thrain and Thorin in their wandering until they made their home in the Blue Mountains. In 2841, Balin and Dwalin accompanied Thrain when he set out with the intention of reclaiming the Lonely Mountain from Smaug. They were pursued by the minions of Sauron, who sought the Ring of the Dwarves borne by Thrain. One night while camping in the eaves of Mirkwood in 2845, Thrain was captured and taken to Dol Guldur. Balin and Dwalin and the other Dwarves sought him in vain. In 2941, Balin once again set out on a quest to the Lonely Mountain as one of the thirteen Dwarves led by Thorin and accompanied by Gandalf. Balin was the second Dwarf to arrive at Bag End, after his brother Dwalin, and he requested beer from his host Bilbo Baggins. Balin’s hood was red and he played the viol. Balin stood at the door of the Green Dragon in Bywater watching for the Hobbit to arrive before the company embarked. Balin usually served as the look-out and he was the first to spot the campfire of the Trolls. He was also the first to try to come to Bilbo’s aid although he was captured along with the others. Balin was again on look-out duty after the Dwarves escaped from the Orcs of the Misty Mountains without Bilbo. Bilbo crept right past Balin using the magic Ring he had found in Gollum’s cave. 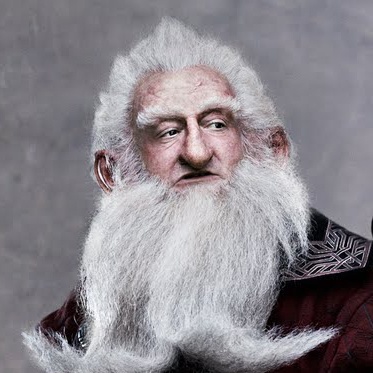 No one had ever been able to get by Balin before, and he took his hood off to the Hobbit. When the company was attacked by Great Spiders in Mirkwood, Balin quickly grasped Bilbo’s plan of escape and led the Dwarves in attacking the Spiders with rocks while an invisible Bilbo lured them with taunts. Afterwards Balin was pleased to learn that it had been the Ring which had allowed Bilbo to sneak past him. After Thorin was taken captive and the other Dwarves were brought before King Thranduil of Mirkwood, Balin, as the eldest, spoke for the company but they were thrown into prison. During their escape, Balin stood guard over Galion, the king’s butler, while Bilbo packed the Dwarves into barrels to be sent down the Forest River. At the Lonely Mountain, Balin accompanied Bilbo part of the way down the tunnel leading to Smaug’s lair, for he was fond of the Hobbit. He was delighted when Bilbo returned and carried him back up the passage. After Bilbo’s second visit to Smaug’s lair, the Hobbit was worried that he had told the Dragon too much, and Balin tried to comfort him. Balin and Thorin reminisced about the magnificent treasures wrought in the Lonely Mountain, and after Smaug left the mountain the Dwarves ventured into his lair. Balin went to Bilbo’s aid when the Hobbit’s torch went out saying, “It is about our turn to help and I am quite willing to go.” (Hobbit, p. 250) Balin suggested that they go to the look-out point on Ravenhill, and there they met the raven Roac who brought them news of of Smaug’s death and the assembling armies of Lake-Men and Wood-Elves. After the Battle of the Five Armies, Balin made his home at the Lonely Mountain and became prosperous. In 2949 he and Gandalf visited Bilbo in the Shire. By 2989, Balin had become restless. He decided to lead an expedition to Moria, where the great Dwarf realm of Khazad-dum had been before it fell to darkness and evil. Balin hoped to find mithril there, and he also hoped to find the last of the Seven Rings of the Dwarves which had long been lost. With Balin went Ori and Oin and a number of other Dwarves. When they arrived in the Dimrill Dale, Balin and the Dwarves found Orcs guarding the East-gate of Moria. The Dwarves slew many Orcs and took up residence in the Twenty-first Hall in Moria. Balin set up his seat in the Chamber of Mazarbul and was named Lord of Moria. The Dwarves found mithril in Moria but their colony lasted only five years. Their presence stirred up the Balrog that lurked in the depths of Moria. On November 10, 2994, Balin went into Dimrill Dale to look into Mirrormere and was shot and killed by an Orc. He was entombed in the Chamber of Mazarbul. The Dwarves were besieged by Orcs and the Watcher in the Water blocked the West-gate. All of the Dwarves in Balin’s party were killed. On January 15, 3019, the Fellowship discovered Balin’s tomb in the Chamber of Mazarbul along with the Book of Mazarbul that recorded the Dwarves’ tragic end. The roof of the Chamber of Mazarbul collapsed during a battle of wills between Gandalf and the Balrog on the other side of the chamber door, and Balin’s tomb was buried deep in the rubble.